Aert van der Neer specialised in winter landscape, evening views and moonlit scenes. While not particularly innovative with regard to their compositions, they reveal new approaches in their careful study of light and reflections particularly in his compositions illuminated by pale moonlight. It would seem that the artist started painting at a relatively late age as his first known work dates from 1632 and his first landscape from 1633. It is thought that he may have studied in Gorinchem with Rafael Govertsz. Camphuysen as a series of documents indicate that they were associated, while the influence of the Camphuysen brothers is evident in Van der Neer’s earliest works. This is the case with Wooded River Landscape, whose composition relates to a work by Rafael Camphuysen in a private collection. 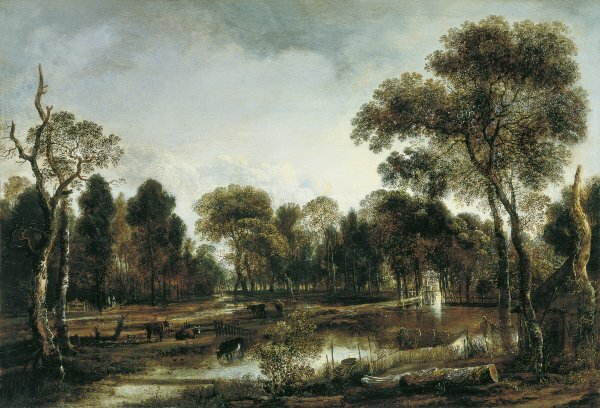 Van der Neer locates the river in the centre of the panel whose left bank is occupied by a flooded meadow framed on either side by two pairs of trees with knotted trunks and green upper branches of a type typical in his oeuvre. The spatial recession is created by the screen of trees in the middle ground at whose base an area of flat land spreads out and extends from the foreground. The sense of depth is emphasised by the brightly lit areas between the trunks such as the one on the right. The two riders on the left making their way among the trees are also a habitual device in these compositions and are often included to emphasise the sense of breadth and space. The panel was dated by Bachmann to around the mid-1640s. Its technique and subject-matter have been related to other works by Van der Neer in the Boijmans Van Beuningen Museum in Rotterdam, the Rijksmuseum, Amsterdam, the National Gallery, London, and the former collection of Samuel S. Joseph. In all of these works a large area of water is framed by a wooded setting in which we find various buildings and figures. The landscape, which was painted by Van der Neer in his studio, is bathed in an evening light that creates golden and reddish tones, transforming the real colours and creating a sense of overall harmony through its muted monochromatic tonality. These colours contrast with the ones used in the sky in which a large area of white clouds with touches of blue and pink functions to highlight the branches of the green treetops. The painting was acquired for the collection in 1957 from the Boer gallery in Amsterdam.